This article originally ran on author Gae Polisner's blog "That Wee Bit Heap" as part of a series on Karma and Coincidence that coincided with her release of The Summer of Letting Go. Please check the other interesting stories in this series, as well as her fantastic books by clicking on her blog name above. From my earliest days, coincidences have peppered my life—a missed bus allowing me to meet a new friend, a job loss sending my career in a better direction, a chance conversation with a stranger giving me information I would soon need. Although appreciated, many of these moments have been easy to brush off as simple life twists. But others have left me wondering, and questioning my life’s direction. In 2009, one series of coincidences set me on the path I walk now. I’d been suffering severe headaches and dizzy spells. My blood work came back fine, so my doctor decided I suffered from stress and prescribed anti-depressants to help. The second day I took them, the left side of my body went numb and my coworkers rushed me to the hospital on my doctor’s recommendation. A suspected stroke diagnosis pushed me through the system, but what they found on my MRI surprised everyone. I had two brain aneurysms. My neurologist later told me I would likely have been dead within 10 years if they hadn’t caught them. He told me it was lucky I had a rare side effect to the medication. Fast forward two months. My lymph nodes felt enlarged and I saw my family doctor again. Because he felt bad about missing the aneurysms, he decided to be overcautious with my newest symptom and sent me for an ultrasound. 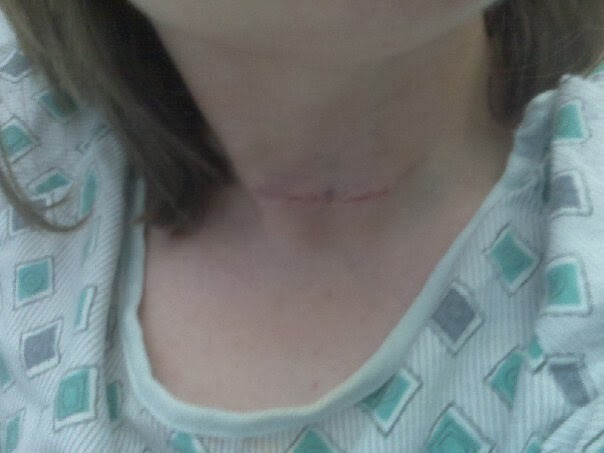 It showed two suspicious nodes on my thyroid. Although a fine needle biopsy came back negative, the radiologist performing the procedure said it reacted like cancer and would not accept the lab results as accurate. He scheduled me for surgery. The surgeon told me that most suspicious nodes come back negative and the only time he would worry is if Dr. Smith* had done the biopsy. Apparently Dr. Smith is considered a “cancer savant” by hospital staff and, you guessed it, he was the one who performed my biopsy. The ultrasounds facility had 10 rotating doctors on staff. By slim luck, I got the one doctor who recognized my cancer when the others likely would have sent me home as “safe”. Final lab results confirmed his suspicions. My endocrinologist said I was fortunate my family doctor had been overcautious. The odds of beating thyroid cancer are small once it metastasizes. It’s hard not to believe someone somewhere was looking out for me that year—even if it was just a drug manufacturer, my nervous doctor, the person who scheduled my biopsy, and a rare Radiologist. Thanks to them and those few months, I started writing again. The cliché is true. Life is too short not to do what you love. I found my old love again and set my life back on course—a life granted to me by a series of lucky coincidences. Awesome article to share with us…wow!